Waffling: Marathon Training Week 12: Goals and Race Plan! Marathon Training Week 12: Goals and Race Plan! I am happy to report that the knee seems to be on the mend!!!! I had a little pain on my run on Tuesday, but I saw my physio on Thursday and she did some fantastic work on my knee and quads and gave my IT band a break. That seems to be just what it wanted because it felt so great after and I had no issues with any of my runs the rest of the week. I didn't even PLAN to do 18K on Sunday! My plan was to go out and turn around when the knee started to act up and then switch to the bike, but the knee never acted up! I was almost at full mileage this week!! As you may have also noticed, I am running slow as molasses right now too. I'd rather be slow than aggravate my knee, so I am foregoing any speedwork. Plus my physio recommended taking smaller strides to lessen the impact of each step, and that slowed me down too. But yay pain free runs! Overall Goal: Enjoy my first marathon and not die! I think they are all obtainable! A 4:30 finish would mean a pace of about 6:23/km. I am certainly not running that right NOW with my knee and all, but I think with a lot of rest that pace might actually be achievable. I ran my half marathon with a 5:27 pace!! I always do much faster in races than I do in training, but a marathon is a whole new beast. I need to respect the distance and not cause myself further injury. I have been studying the race map and elevation chart and reading some other people's reports of the race online to get a good plan going for race day as well. It is one thing to pick a goal pace, but quite another to stick to it over hills and turns and winds and whatever else May 1st will bring! 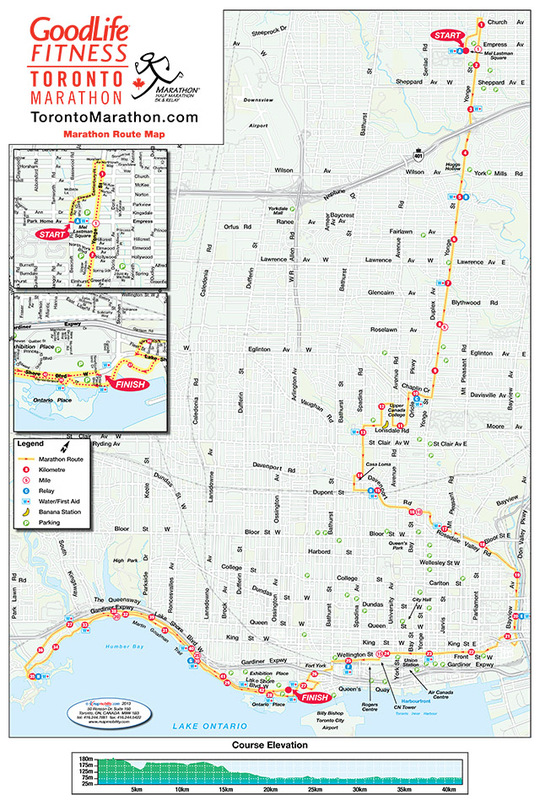 The race starts off in North York and generally follows Yonge St until midtown when we go west for a bit and then east to the river, then cut through downtown for awhile, with the last 10K as an out and back along the waterfront. I am happy the last 10K is in that spot because that will be the hardest part of the race mentally (and physically) and I know that road like the back of my hand, since I run it nearly 4 times a week! In fact, I am pretty familiar with the entire 2nd half of the race. The first half I don't know at all so Cam and I are planning on doing a drive along it. I can tell from the elevation chart that it is somewhat hilly in the first half, but only one BIG hill about 5km in. Otherwise it looks like (and other reviews have said), mostly downhill for the first half and then flat! A very fast course! Km 1-5: allow myself to get a little swept up in the excitement and maybe go a bit too fast. Hey- it's my first marathon! Km 5-20: Hit that hill and get a nice reality check. Then try and stay steady and easy and hope I bank a few minutes from the downhills. I am getting super excited for May 1st to come! What a great course for your first marathon!!! So glad to hear your knee is feeling better. Yowza a 5:27 pace -- that is just incredible to me.